Richard Monje, Vice President of Workers United/SEIU, explained on Occupy Radio (listen here) that with the steady outsourcing of manufacturing jobs overseas, labor in the United States features a higher percentage of service jobs and traditionally white-collar jobs that now receive blue-collar level wages. Pen-pushing and paper-shuffling ain’t what it used to be, especially as the cost of living rises above the scope of the average salary. No matter the amount, a vast number of Americans are living from one paycheck to another. Loan repayments and credit card interest are considered regular monthly expenses for the bulk of the populace. Richard spoke about the low membership rates of the labor unions, proposing that the decline is as much related to an identity crisis as it is to the concessions union leaders have been forced to make on wages, health benefits, and workplace conditions in order to keep some jobs in the US. While issues such as union leader corruption, co-option of movements, and challenging political environments have also contributed to falling membership rates, self-identity may be the reason many American workers do not belong to unions. “Labor is work,” Richard says, but to a public that identifies primarily as middle-class consumers, laborers are those that earn wages by the sweat of their brows . . . which rules out many service industry workers. Sweat is a thing of the past, as are muscles formed in the workplace, not at the gym. Ask the average corporate officer worker about the labor movement, and he may look at you strangely before pulling out his iPhone to Google labor movement as he hops on the train to the suburbs to pick up his car at the commuter station. But he is a laborer, as is the burger flipper, the shelf stocker, the landscaper, the bank teller, the checkout clerk, the school teacher, the phone company employee in customer service, the street vendor, the local organic farmer, the barista, the solar panel installer, the biology intern collecting samples in the field, the river rafting guide, and the truck driver. The face of labor is changing. The types of work have shifted, but as a people, we are still workers. Very few of us are men or women of leisure, trust-funders, or even stay-at-home moms. This case of mistaken identity is not really an error; it is a carefully cultivated, advertised, and marketed switch. As laborers we provide goods. As consumers we spend money. It is an important distinction. Consumers shop. Laborers strike. It is essential to the profits of the wealthy that people continue to identify as consumers. Mass media and entertainment churn out stories that reinforce the worship of wealth. In 2013, the sixth film version of The Great Gatsby was produced. The book topped the bestseller list. Oprah.com helped drive millions of Americans to read the classic, watch the movie, and discuss the foibles of the rich. The website referred to the movie as a ” . . . thoughtful, inspiring story to help you succeed.” But what did the American people learn from the story of self-involved, wealthy narcissists who trample hearts, ruin lives, and run people over without a backward glance? We learned that the wealthy are beautiful, fascinating, tragic, and careless. We ogled their riches, admired the dresses, lusted for old cars, dreamed of poolside soirees, and our addiction to the culture of wealth continued. Here is a different story: The Jungle. Oh yes, you think, that book by Upton Sinclair about the meatpacking industry. Many of us read it in high school, along with The Great Gatsby. But it is unlikely to grace today’s silver screen – the only movie version was a 1914 silent picture that is now considered a “lost film”. The Jungle won’t appear in famous book clubs nor receive a major marketing push by the publishing houses. Why? Because The Jungle is not a book about the meatpacking industry. It is a story about you. It is a story about labor and an anthem to justice; a rabble-rousing, muckraking expose of the workplace murders of millions. It is the all too familiar story of husbands and wives both forced to work. It hits home with children who dropout of school and take low-paying jobs. It is the tale of good people swindled by greed, of mortgages and foreclosures, and of enslavement to debt. It tells the heart-breaking tale of people like you who become trapped, trying to survive as wage-slaves yearning for less work and more time. But this book will not be marketed into a bestseller anytime soon, because it is also the story of organizing, boycott, and striking. It is the story of political corruption that sounds all too familiar, of crony capitalists, big banks, and wars only for profit. It tells of robber barons, Gilded Ages, extreme wealth, unobtainable lifestyles of the rich, ghettos and slums, crimes for survival, corrupt prisons, courts without justice, and most importantly, the people rising up on behalf of humanity. 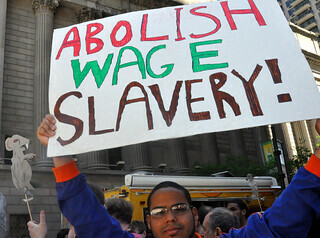 It is the echo of today and a reminder of another time in human history when the Labor Movement encompassed the globe. When immigrants flooded America and brought union organizers with them from the Old Country. When Italy rose in protest of austerity, Little Italy took to the streets. When Lithuanians struck to protest unlivable wages, masses of family members went on strike in this country. When Romanians wrote to their New World relatives begging for money to be sent home, the New World relatives wrote back that they could hardly survive. There was work in the New World, but the rents shot through the roof; the children were sick and the doctor cost too much; they had to commute and that added up. At the end of the day they were further in debt . . . just like their family in the Old World. The Wobblies, my friends, refers to the IWW, and for those of us whose standard education conveniently glossed over this knowledge, that stands for Industrial Workers of the World. It was not a glorified title of a handful of disgruntled activists. It was – and still is – a description of the common fate of the world’s workers. Today, labor organizers like Richard Monje and activists like the Occupiers recognize that the struggle continues to be global. When US workers went on strike against toxins and the jobs went overseas to poison others – that was not justice for workers. When we protested pollution and the smokestacks closed over our cities, but rose to pollute Beijing – that was not justice for workers. When we demanded healthcare, shorter hours and better wages only to see our offices outsourced to India – that was not justice for our workers or theirs. When we were sold our identity as consumers, but then lost our ability to buy in – that was not justice for workers. When we see the same destructive cycle being packaged up for the rest of the world, we know that is not justice for workers, humanity, or the planet. The labor crisis in our country is a failure of identity as this nation of workers denies their history, heritage, and legacy in favor of the glossy, seductive allure of consumerism. We wish to be affluent and to ignore all our woes. The empowered elite propagates this notion to us on billboards, television, radio, movies and online. They do everything they can to keep us asleep – in the dream of prosperity, in the nightmare of debt. Somewhere, my friends, the dawn is rising. Just around the corner of today, women march in the streets, children sing, men hold the banners aloft, and the cry resounds proudly: We are workers! We labor! We deserve justice and equality! We may work at computers, but we are still descended from the lineage of laborers who struggled for better wages, decent jobs, eight-hour days, the end of child labor, and the concept of the breadwinner. We carry the standard of the women who demanded equal salaries, the end of sexual harassment in the workplace, and the notion that either one woman or one man should be able to support a whole family. We are the brothers and sisters of workers worldwide. We are the common bearers of the destiny of the planet. Our fate is entwined with all of humanity if only we can embrace our common identity as workers. This entry was posted in All Posts News Politics and-or Videos, History, Labor, Politics and tagged IWW, Labor Unions, Longreads, Richard Monje, Rivera Sun, Wobblies, WPLongform. Bookmark the permalink. This is the heart of the matter, no doubt about it Rivera. The Jungle was clearly a game-changer. I believe we are witnessing another massive and unprecedented urgent shift ~ a de-coupling from received assumptions, if you like. We have to rethink scale, plant efficiencies, social contexts, productive interactions and connectivity ~ but more than anything, determine our priorities in terms of real (humane, not just human) needs. There is no virtue in simply rearranging the same old stuff, when we must first decide exactly what is important for life support in terms of practical means & effective methods. Non-destructive industry is possible, in a variety of forms ~ but it cannot function in an ecological wasteland.